Tonight on CBS CRIMINAL MINDS continues with another new episode called, “Final Shot.” On tonight’s season 9 episode 3 Eva LaRue guest stars as FBI Agent Tanya Mays, who assists the BAU with the investigation. Did you watch last week’s episode? If you want to catch up before tonight’s new episode, we have a full and detailed recap, right here. 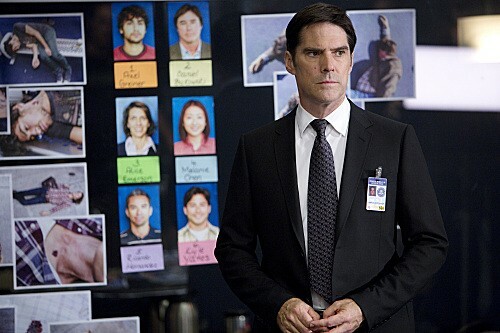 On last week’s show the BAU zeroed in on the suspect of the ritualistic killings they had been investigating in Arizona, a bizarre connection within the UnSub’s family could lead them to finally nab the suspect. Guest starring on last week’s episode includes Emmy Award-winning actress Camryn Manheim as Carla Hines and Fred Koehler as her son, Wallace Hines. On tonight’s show When a sniper strikes Dallas, the BAU investigates whether the upcoming anniversary of the Kennedy assassination is a motivating factor or if something else is driving the UnSub. Eva LaRue guest stars as FBI Agent Tanya Mays, who assists the BAU with the investigation. In a crowded Dallas plaza area, shots rain down from seemingly out of nowhere. The Bau thinks it could be terrorism or ,and this is weirdly plausible, an act of vengeance on the anniversary of JFK’s shooting. It’s near the area and the timing is off only by minutes but is this really because of JFK? 5 confirmed dead and 6 are hospitalized in an act that took all of 10 seconds. There haven’t been any threats prior to this and the man in charge down in Dallas did say they got a lot crazies over JFK’s anniversary. Maybe the idea wasn’t as out there as they thought. While the police and BAU are looking into the shooter’s technique, he was a crap shot, they found out the last victim could have seen the shooter. They try to ask the people that survived the ordeal if they saw anything and only one woman recalls seeing a bald white guy in the window. What they don’t know is they should be asking a unknown man and woman that are currently on the run. The two people believe they’ll be the next targets. Could it have to because they’re black? Garcia is seeing connections to the white supremacists. One of the victims was the DA prosecuting the case against a man named the “General”. Morgan and Jennifer go to see him in prison. He claims he’s no longer a racist yet he watches every movement between Jennifer and Morgan. Although he is telling the truth about not having the DA killed. Another twist in the story the team is crafting; The shooter killed all, 6 now, with perfect precision. The random shots in the trees and building were there to throw off the cops. The sniper knew exactly who they wanted to kill and the real victim is lost in the crowd. They don’t even have time to fathom that before the second shooting occurs. This time the victim looked like they were called by the shooter. Who else would threaten her to do something in order to protect her family? The agents can now try to connect the victims from both occasions. Whoever matches could have been the intended all along and hopefully lead them to a killer. The killer is skilled and methodical. He may have military or police force background and of course he has a god complex. The couple hiding got themselves with a very powerful person. At first she attempted to do it alone and until her new friend joined her. Now they think that man is targeting them. Again why? One of the victims was Alice and she was a social worker. She was acting strangely that day. Garcia found her last text was simply a name. Rebecca who happens to be a victim from the second shooting. These women both help women escape from abusive homes and loved ones. The shooter could have threaten them into revealing the next name in this underground railroad. Such as the woman hiding out in an apartment with the man that wants to keep her safe, Colin. The powerful man she went against was her husband. A man she was doing her best to escape. Her name is Maya and her husband works at a quasi-military operation. He had reported her missing and then when he decided to killer her he told the cops she was staying with relatives on the east coast. His name is Eric and he runs the moments he sees agents show up at his office. They get into shoot-out when much to his detriment Eric runs in front of an oncoming bus and dies. Now the team doesn’t know if his snipers have found Maya yet. Tracing down their leads they find Maya’s apartment where the sniper is most likely hiding in wait. He can’t make it seem that her shooting wasn’t random. He’s going to kill whoever is near her in that apartment. The sniper has to stay awake for several hours and to do that he created a fantasy. Such as the he was the one that was helping her to escape her husband. The whole couple on the run was all make believe. He only ever saw Maya throw his lens. Colin was the sniper and he got taken down by another skilled sniper hiding in the shadows. Maya is safe just as she was in Colin’s mind.